Let’s start our journey at the beginning and define mixed-use property. What is Mixed-Use Commercial Property? Mixed-use commercial property is either a building or a land development that includes both residential and commercial space. For example, a structure that has office space on the ground floor and apartment units on the top floor would be considered mixed-use residential or mixed-use office space. As is familiar with most mixed-use properties, the residential portion takes up more square footage than the commercial share. For tenants, mixed-use space is commonly referred to as a live-work space. Mixed-use commercial real estate has also become a central piece of urban development planning. Developers may combine residential, commercial, cultural, institutional, and even entertainment functions to create a fully-blended multi-use setting. Or, entities can be disconnected entirely, yet co-exist on the same parcel of land. Commercial real estate development within the mixed-use sector can take up a single building or span an entire city block or neighborhood. Planners can create a theme within a multi-use structure, in which all residents and business owners share an everyday lifestyle, economic status, or cultural vision. As an area becomes more populated and industrialized, mixed-use property for sale becomes more valuable and creates a more efficient ecosystem among all inhabitants. When carefully planned and executed well, mixed-use real estate can incorporate various types of functions that complement each other. Why is Mixed-Use Commercial Real Estate Becoming More Popular? In each of the examples listed above, developers and investors sought innovative ways to combine urban-style living with close-knit communities in which everything was in walking distance. That was the intent and result of our very own mixed-use development services team when they conceived and completed the Highpoint on Columbus Commons project mentioned above. Today, mixed-used real estate is as popular as ever, attracting investors from around the globe, as well as millennial homebuyers and entrepreneurs looking for startup opportunities. So, why the steady rise in demand for mixed-use property for sale over the past 20 years? There are 4 main reasons for the mixed-use property craze! Great for business. Local businesses thrive on proximity to their client base, so what’s better than sharing a building full of prospective customers? Today’s generation values convenience, and they’ll bypass online marketplaces for the brick-and-mortar stores they walk by every day. Diversity of tenants. For property owners and property management companies, a mixed-use apartment building can efficiently address the diverse needs of both residents and business owners. Convenience steps away. According to the National Community and Transportation Preference Survey by the National Association of REALTORS®, 53 percent of Americans prefer walkable communities. Residents and business owners enjoy access to schools, libraries, parks, and other facilities — all within an arm’s reach. Less risky investment. Mixed-use real estate investors and developers incur far less risk due to the high demand and diversity of space. Typically, a property owner who rents a standalone retail store or building risks a substantial decrease in revenue should they lose a tenant. Mixed-use properties offer a buffer because the loss of one tenant minimally impacts revenue. In essence, mixed-use properties are defined by their efficient design, convenient location, a wide range of amenities, affordability, and high-quality tenants. These characteristics are the lifeblood of any thriving mixed-use commercial property. Zoning, which are the laws governing how land will be used, has created more opportunities for mixed-use properties. These laws essentially give permission for commercial properties to exist and sell in otherwise residential areas. We won’t get into the details of how municipalities determine what land use is permitted or prohibited; however, it is evident that local governments are following cultural trends and loosening the separation of residential and commercial developments. The prevailing theory by developers is that residents will enjoy more convenient access to the products and services they use every day. The residential–commercial mix central to a town’s center may be the oldest mixed-use real estate model in existence. The “Main Street” model stretches back at least two centuries to Victorian-era Great Britain and has become a mainstay in American life almost from the country’s inception. Main Street mixed-use property for sale typically includes two- to three-story buildings with residential units within the top floors and commercial units on the ground floor — all facing the main street, of course! Small businesses are the lifeblood of communities throughout the US and central to the growth of mixed-use properties. An archetypal “live + work” mixed-use space includes residents living in the same building where they operate their small business. Living spaces may be above, behind, or alongside the commercial space. For instance, a photographer or artist’s loft might be a bedroom over a studio. In some cases, business partners may live adjacent to one another in multiple units above their business on the ground level. The desire to “live where you work” is rising with each subsequent generation entering the workforce. Therefore, the growth of small office units within mixed-use residential communities is unparalleled. These multi-floor commercial structures feature small retail and professional service companies with office floor plans that cater to businesses with a small footprint. Not uncommon in major metropolitan areas across the country, a combination of office and residential units are now found in many suburban areas as well. Mixed-use office space is primarily a commercial structure with multi-residential family units co-existing in the same building. Online shopping has led to an inevitable decline in shopping malls. For creative developers, repurposing these vacated shopping malls showcases an incredible push toward innovation. As a result, shopping malls now have new life as a mixed-use commercial property with residential units included. Throw in some office units and shopping mall conversions perfectly capture the live-work-play culture. After years of neglect, decline, and outright abandonment, downtown and suburban retail areas are experiencing a renaissance. No matter if you live in a small, medium, or large US city, these areas are seeing a shift from commercial-only to commercial and residential. Highpoint on Columbus Commons is a perfect example of a deteriorating retail space re-energized by a mixed-use residential makeover. Thousands of residents now enjoy Downtown Columbus in a park-like setting with conveniences from neighboring businesses. One of the latest trends in mixed-use property for sale is within the hotel sector. Hoteliers continue to find innovative ways to attract new clients while enhancing their profitability. As such, today’s mixed-use hotels often combine hotel rooms and condos and/or retail space. Some properties even feature some level of office space or co-working facility, thus perfectly showcasing the live-work-play model. Each new type of mixed-use property offers a fresh and unconventional look at how we use space. While many of these mixed-use property types seem to blend, there’s no doubt that developers will continue to push the boundaries (or maybe reel them in). Mixed-use property for sale is exciting, isn’t it? Just think about all the possibilities of an investment opportunity in mixed-use real estate. Before you pull out your checkbook, discover some of the benefits below. As we mentioned before, mixed-use property is not a new concept. Entire societies have been built on this real estate model. While mixed-use properties may be erroneously aligned with other fads that seem to sprout from the Millennial generation, mixed-use properties have an appeal across all generations. The primary reason for the excitement is primarily due to the communal nature of mixed-use commercial real estate. Still not sure if a mixed-use investment property for sale is a safe bet? Consider this: The mixed-use real estate model ensures the sustainability of brick-and-mortar retail facilities across numerous industries. While e-commerce juggernauts such as eBay, Amazon, and even Walmart have threatened the livelihood of local (and physical) businesses, mixed-use commercial real estate has proven that consumers still want to get out and enjoy a more tangible shopping experience. For example, customers still like trying on clothes, getting their hair done, eating out, going to the dentist, checking out home furnishings, and grabbing a cup of coffee. For investors in mixed-use property for sale, the singular challenge is determining what type of business to include in a mixed-use real estate community. What will attract and keep tenants in your mixed-use real estate development? And, just like opening a new business, you will be tasked with understanding the market and uncovering the perfect activity that will sustain your growth for years to come. approve of sustainability and smart, green technology. We all know the potential problems associated with irresponsible and reckless tenants. Live/work tenants, however, have a particular interest in the maintenance and care of the mixed-use property. Tenants who live where they work are generally less problematic with rent payments and property maintenance. Tenants can be notorious for breaking leases abruptly — even if it means losing their deposit or not paying the last month’s rent. However, investors who buy mixed-use property, experience longer tenant retention. Due to the high demand for mixed-use real estate developments in major metropolitan markets, tenants often have to go on waiting lists to secure a residential or commercial property. Once they finally get inside a community, they realize quickly that the development often exceeds their expectations. Therefore, tenants do not want to leave. Walkability, safety, affordability, amenities, and other features make living in a residential and commercial development of this kind too irresistible to leave. Business owners that have a high rate of success are less likely to give up such prime real estate. Lastly, multi-use developments often foster a community mindset in which residents and business owners form a tight-knit neighborhood. People who are drawn to a tight community will usually stay in that community regardless of other opportunities that might lie elsewhere. By their very nature, mixed-use properties for sale allow investors to develop nearly any residential/commercial arrangement within a seemingly limitless scope of ideas. It seems that the more conceptual a developer becomes with the model, the more attractive the development becomes in the mixed-use real estate market. What are some trends that are currently attracting consumers to a mixed-use property for sale? Let’s take a look at some examples, below. 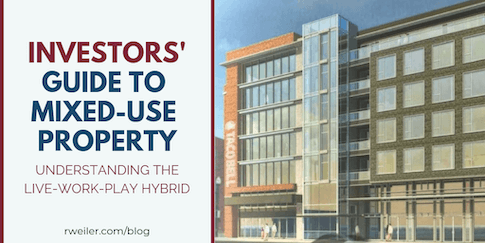 A trending example of a mixed-use property for sale is the idea of trading in the traditional hotel model for mixed-use hotels such as extended-stay or mini-stay residential complexes. Take, for example, The Fig, a 4.4-acre complex that comprises a hotel, residential college-student housing, and several retail spaces near the University of Southern California. The extended stay housing was a more attractive setup that gave investors the flexibility of filling up the spaces short-term or long-term. A student could stay during the school year, or guests of the university could book the rooms during a week-long conference. All the amenities made the mixed-use real estate development even more attractive for all occupants and guests. For mixed-use commercial property development to work, city planners have to reconsider zoning laws in specified areas of the town. Zoning regulations were established in most cities to separate residents from industrialization. And, the division ensured the security and safety of residents. Mixed-use property for sale has morphed zoning laws. Most metro city planners still adhere to strict zoning codes but allow the codes to apply differently in certain areas of town on a case-by-case basis. The determining factor is what a developer brings to the table that can stimulate an area’s economy without endangering a development’s citizens or business owners. Where the rezoning trend is taking root is in integrating residential units into already established commercial zones and properties. A glaring example of this is the nationally-recognized Midtown just outside of downtown Atlanta. This diverse, culturally-driven district attracts thousands of visitors from all over the world each year. While businesses in Midtown have traditionally thrived, living in the area has always been challenging due to the zoning codes. City planners came up with a specific long-term process for developing streetscapes and mixed-use property projects. Midtown even has a special zoning category for such uses within designated geographic areas. Now developers can reconceptualize buildings that were either empty or half-empty by integrating residential units into already established commercial properties. Surprisingly, in today’s residential and business world, people want to be around other people. Gen-Xers and Hipsters may have enjoyed a brief period of isolationism and anti-establishment sentiment; however, Millennials and early Gen-Z’ers prefer community and social interaction. The social-over-everything mentality that dominates the culture has spilled over into work, family, and community. Developers and investors in a mixed-use property for sale are in tune with this cultural shift. And, they have responded by creating work-live-play environments where entire communities build careers, engage with family, and spend quality time together. As conventional, large brick-and-mortar retail businesses crumble, retailers that are succeeding and experiencing exponential growth are offering elements of experience and a place where people gather instead of just shop. While business behemoths such as Whole Foods Market, Starbucks, and Apple Store have set the template, local businesses have also benefited from the same format. Mixed-use property developers have created entire multi-property settings based on the social-over-everything cultural trend. Why Invest in Mixed-Use Properties in Columbus, Ohio? The Columbus Region — a flourishing 11-county territory in Central Ohio — is home to 2.1 million residents and is the fastest growing metropolitan area in the Midwest. For nearly a decade, the Region has led the Midwest’s largest major urban regions in job expansion, population, and gross domestic product (GDP) growth. Columbus is the HQ of some of the world’s most recognizable brands—Scotts, Express, JPMorgan Chase, Nationwide, and Abercrombie & Fitch. Fortune 500 corporations thrive here, but they’re not the only businesses to have success in our community. Millennials have moved to Columbus, OH by the thousands to launch startups in nearly every industry imaginable. Millennials have become Columbus’s most prolific and entrepreneurial demographic. There are several reasons for this: The cost of living in Columbus, Ohio is competitive. The real estate market is affordable — a median listing price of a typical Columbus home is $130,000 with an average price of $87 per square foot. The cost of living index is 84, compared to the national average of 100. Groceries, utilities, transportation, and health costs are all affordable in Columbus when compared to the remainder of the U.S.
Columbus’s culture and nightlife are also booming. An endless range of eateries, bars, coffee shops, and other cultural cuisine attracts people of all backgrounds and tastes. The people engage in all types of activities that include music, theater, sports, and activities for singles and families. Accessibility throughout Columbus has drastically improved due to the current urban development strategies that have emerged over the last ten years. Residents can enjoy dense, walkable neighborhoods and access Care2Go, CoGo Bike Share, Uber, and the COTA public transport system. While this particular article concentrates on mixed-use property for sale, you should not underscore the opportunities that all types of commercial real estate has to offer. After reading this complete guide on mixed-use properties, you may want to take a look at our in-depth review of commercial property for sale in Columbus, Ohio. Our region has seen incredible growth over the last decade with proven ROI. Prominent areas of Columbus, Ohio are transforming into mixed-use real estate development communities that are meeting the needs of residents across all demographics. Developers are renovating existing buildings and erecting new structures downtown as well as along the suburbs. In doing so, designers are filling in gaps in various markets where mixed-use properties can stimulate the economy. These properties occupy shared amenity spaces on multiple levels of the structures. In order to assess the strength of the mixed-use property sector, it is essential to assess the current numbers. Investors who are looking to develop or purchase mixed-use commercial property in Columbus, Ohio should be aware of the following statistics, which paints a clearer picture of the market. There are 598 mixed-use properties. The average assessed value of mixed-use property units is $132,374. Mixed-use property unit sale prices have a median of $109,250. The average price per square foot of mixed-use properties is $19. The average lot size of mixed-use properties is 5,271 square feet. The aggregate building area for mixed-use properties is 14,981 square feet. There are 1,510 mortgages for mixed-use properties. As with any commercial property, achieving ROI on a mixed-use property for sale requires that you identify the right investment opportunities, practice due diligence, and learn to live with a degree of risk. So how do mixed-use properties differ from other types of commercial properties? The critical component to maximizing your ROI in a mixed-use property is tenant retention — among both residents and business owners. You must be able to create an environment in which people want to live, shop, work, and spend time together. Therefore, your design concept must foster and stimulate tenant interaction and not discourage it. Tenant interaction leads to tenant retention, which leads to a higher ROI. After all, if your property suffers from vacancies, you’ll have a difficult time generating and maintaining a healthy cash flow. One of the ways you can contribute to tenant retention is to promote local startups. These new businesses may present an inherent risk, but they also fuel a sense of community that mixed-use properties are built upon. Support startups such as coffee shops, novelty restaurants and delis, service-driven businesses, entertainment venues, grocers, small consumer-driven tech businesses, salons, and spas in these red-hot markets. If you have made it to the end of this article, congratulations! You must be ready to make an investment in mixed-use property for sale, one of the fastest-growing commercial real estate sectors in the country. As with any significant purchase, it is critical to have a knowledgeable partner by your side. And, as a commercial real estate development and brokerage firm with an 80-year track record in the industry, The Robert Weiler Company offers unrivaled expertise. To say it succinctly, we’ve been there and done that with many mixed-use properties under our belt. The Robert Weiler Company partners with commercial real estate investors who have an appetite for building communities, not just structures. As such, we’re prepared to show you how your investment in mixed-use property for sale can shape Columbus, Ohio and Central Ohio. Reach out to us at 614-221-4286.